Dogwood (Cornus spp. ): growing, planting, caring. Dogwoods are widely planted horticulturally - and birds, including quail, feed on the red seeds. Scientific name : Cornus spp. Cornus is a genus of about 30–60 species of woody plants in the family Cornaceae, commonly known as dogwoods, which can generally be distinguished by their blossoms, berries, and distinctive bark. Most are deciduous trees or shrubs, but a few species are nearly herbaceous perennial subshrubs, and a few of the woody species are evergreen. Several species have small heads of inconspicuous flowers surrounded by an involucre of large, typically white petal-like bracts, while others have more open clusters of petal-bearing flowers. 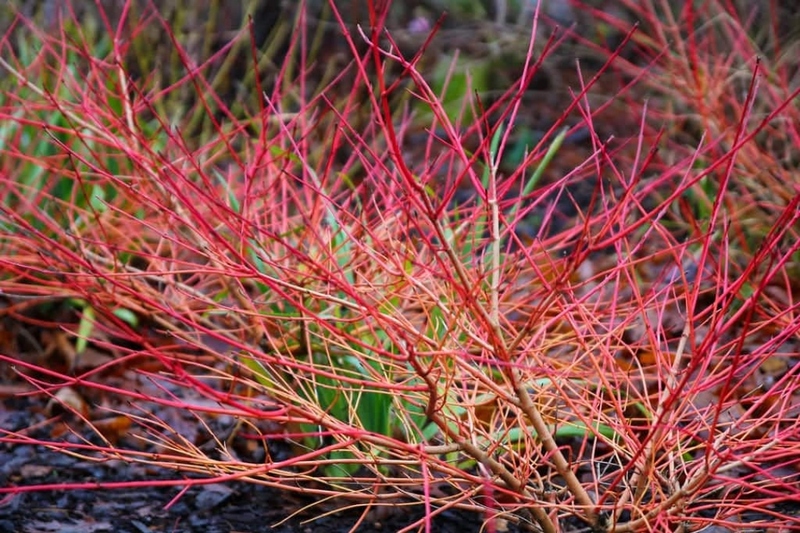 These dogwoods have colorful stems during the winter, on which grow opposite, simple, whole leaves. The flowering is in corymbs of small white flowers. Plant from the end of autumn to the beginning of spring, in the sun, in all types of soil except very rich earth. Don't bury the base of the plant too deeply. Tamp down the earth around the roots, form a shallow basin and water until no more can be absorbed. Mulch in November each year with deciduous wood chips to protect the soil — especially for the first few years — and limit the need for weeding. The first month, water twice a week.